uTorrent is a popular torrent program that tops our list of the best free torrent client software for good reasons. 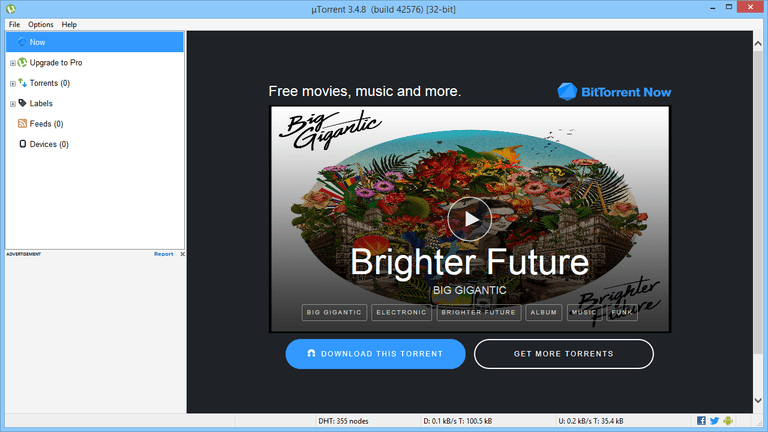 The RSS Downloader and uTorrent Remote web interface are a few of the best features in uTorrent. You can have your favorite RSS items download automatically and control the uTorrent program from any web browser. See these torrent sites for places where you can download torrents for free. Because the RSS downloader is such a useful feature in uTorrent, I want to explain how to set it up and use it correctly. This feature works best with recurring files like TV shows, which are normally released on a scheduled basis. Go to File > Add RSS Feed. Enter the URL of the torrent feed in the window prompt. Choose Automatically download all items published in feed to ensure newly updated feed items are downloaded with uTorrent. Click OK to save the feed and display all the items contained within it. Filter: The Filter section should include the name of the item you wish to download. It should have a common name that can be found in each new feed item, like the name of the TV show. Not: Enter text in the Not area to exclude certain keywords from a feed so they don't get downloaded. For instance, 2013 or 2014|2015 will skip TV shows that have these dates in their name (useful if you're looking for 2016 episodes only). Save in: The next text field in the settings is called Save in, which lets you choose where to save the downloads from the feed. Feed: Because the RSS Downloader settings allows filters for multiple feeds, the next section called Feed lets you select the feed you wish to apply the filtering options to. Quality: The Quality section specifies the quality of the feed item. If you wish to download only 1080p TV shows, then just choose that option. Episode Number: This should be defined so you're not downloading TV shows you already have. Enter numbers for this filter in this form: SeasonXEpisode-Episode. For example, 02X01-20 will download episodes 1-20 of season 2. Minimum interval: The Minimum interval option lets you select how often uTorrent is allowed to download items from the feed. If you choose 1 week, uTorrent will not download a matched feed item for at least a week. Label for new torrents: Finally, the last option is for inputting a label so the downloads have a consistent name. uTorrent should now be fully configured to download RSS items like TV shows automatically. I admit I initially installed uTorrent a long time ago because of it's popularity. It was basically the only torrent downloader I had heard of. However, I quickly realized it was popular for a reason - because it's a great torrent client; and I must agree. It's been obvoius since I started using uTorrent that it doesn't hog system resources. Everything is very smooth and I've never experienced issues. This is important with any program and uTorrent certainly passes. I also like how easy it is to use. For example, if you're in the middle of downloading files and you realize your network bandwidth is being almost entirely consumed by uTorrent, you can quickly right-click the icon in the notification center and change the download or upload speed limit to something less extreme, or even pause everything all together. As I said above, my favorite features are surely the RSS downloader and remote management feature, but I want to also mention the scheduler option from the settings. If enabled, you can define bandwidth caps for specific days and minutes out of the day. This means you can crank up the allocated bandwidth uTorrent can use during hours when you're away and lessen it when you're more likely to be on your computer. This is very helpful if you're on a regular schedule and don't want your other Internet activities to suffer because of uTorrent. Some users have reported that the uTorrent setup installs a program without your knowledge, that may result in high CPU usage even when you aren't actively using uTorrent. If you think this may have happened on your computer, we recommend reading these instructions on how to uninstall the program that could be causing it.